In the previous article “Is Power Factor Correction that important?” we discussed about the significance of power factor correction and the manner in which it can help conserve energy and capital. Furthermore, we hinted on the devices that can be used for the power correction. In this post, we shall expand on the devices front and explain modalities associated with them for a clearer picture. The intention is to explaining the practical aspects behind the process while reviewing four devices. The first device is the PFCD as briefly introduced in the first post. Just for the recap, it is able to optimize the electrical losses by cooling down the device and also controlling the inductive devices. The working principle of PFCD is that it is going to lower down the load that your devices draw from the power utility company. This reactive power instead is stored for optimization of usage. With more usage from the PFCD than the reactive power being withdrawn from the utility supply, there is an overall increase in the power factor. First the PFCD would withdraw the power, and then store it for functional supply to the inductive motor & other loads. This working capacity has a two tier effect with users getting an economic incentive with lesser bills and your machinery being saved from the plight of power surges and a fluctuating power supply. From a simple perspective, the working mechanism also allows for power to be stored in the PFC unit and then recycled. The main objective is to create an electromagnetic field to run the inductive windings of the motor. With local supply coming from the unit rather than else place, there is an overall cooling effect on the machine too. By using such a unit the benefits are plentiful in the sense that you are able to reduce the electrical noise and also enhance the capacity of your working system. The second device is Power Planner II and employs the usage of microcontroller for increasing the power factor. The working capacity of this device is for those inductive motors which fall under the max range of 60 amps. It is also present as a 35 Amp model and works fine with 110 or 220V AC. The microcontroller present in the device functions as an energy management unit and employs algorithms for doing its functions. The programming has been done in such a manner that is possible for the device to reduce consumption in the case the motor systems are unmatched. The technology being used in the controller is known as 8 bit RISC and is considered quite effective against power surge and also burn-outs. Another important feature of the controller is the presence of a range option which allows customization for commercial and industrial options. This relates to the cooling effect and how you can select based upon your requirement. A related advancement in PFC controllers is the creation of ADP 1048 which is a digital power factor correction controller. The focus of this controller is to be able to control the harmonic distortion and hence provide better conduction. Another hallmark of this controller is the digitalization and the accuracy in terms of load management and power factor increment. With more customization options, it is possible to employ this in a variety of appliances and the usage depends on the ingenuity of the engineer. With the main features being described and also the working mechanism, it is obvious that the Power Planner II would be used majorly in industrial units and also commercial electrical units (AC, Pumps, Compressors, Chillers, Exhaust, Air Refrigeration, Conveyors, etc.). Among the latest technology being used, we have usage of thyristors in the place of contactors. The advantage in this case is that there is no time lag and also no voltage is used while switching (in rush current). The inrush current is a stress on the capacitor, and with that being negated out, the life of the machine is extended. This provides a decent solution to the deadlock of load management in specific cases. A related device in the dealing of power factor is Electro Flow. It employs a number of components to accomplish this task (inductors, reactors, capacitors, resistors, etc). The main competence of the system is about its design and also the usage of ladder logic response. The application is based upon the fact that the tuned circuits in the device would have a limited resistive response, thus saving energy. The frequency of the power factor is adjusted to within excellent yield of 95 to 100%. The post has given you an encompassing overview of the usage of such devices and the principle of usage. It is not possible to discuss all variants but the main intention is to understand the mechanism as to how the power factor can be increased. 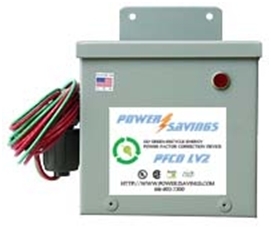 What’s your opinion about this review of 4 Power Factor Correction devices? or copy this trackback: http://engineering.electrical-equipment.org/power-quality/deep-insight-into-power-factor-correction-devices.html/trackback from your own site. These few sentences extracted from the post are just pseudo-technical assumptions, giving no information on the operation and real benefits of the devices. This is just smokescreen used to convince non-informed public to buy inefficient black boxes supposed to save energy. Is Power Factor Correction that important?